Sudden infant death syndrome (SIDS) is a rare but tragic phenomenon that kills thousands of infants each year. SIDS appears to have many contributing risk factors, including second-hand smoke, bedding arrangement, parental co-sleeping, and others, but according to the medical literature, a critical risk factor is infant sleeping position. A large, compelling body of scientific evidence supports the contention that babies who sleep on their backs are much less likely to fall victim to SIDS. Supine-position (sleeping on one’s back) sleep was officially recommended by the American Academy of Pediatrics in 1992 (1). In 1994, the “Back to Sleep” awareness campaign was initiated to educate parents and medical health professionals (campaigns had previously begun in The Netherlands in 1987, and the UK, New Zealand and Australia in 1991). Subsequently, the number of victims of this terrible syndrome were cut in half. Back to Sleep (now called “Safe to Sleep“) is a public health success story. We recently published a post in this space critical of the evidence supporting Back to Sleep from a new contributor. 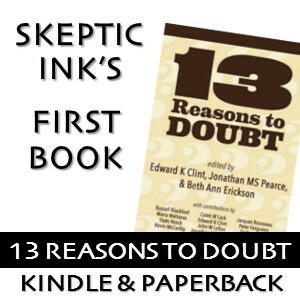 As skeptics, we here at Healthy Skepticism promote the thoughtful questioning of prevailing ideas, including those that might be accepted by official authorities. However, following criticism from great skeptic friends of ours, we scrutinized that post more carefully and determined that it failed to meet an adequate standard of rigor and accuracy. We conclude that it was in some aspects misleading and mischaracterized the medical consensus. I apologize for this lapse in quality, and sincerely thank the community members for their alert criticism. That post was quickly removed and this one is meant to set the record straight. Below I will review the broad medical consensus on this issue and some of the supporting evidence. As always, Healthy Skepticism does not issue medical advice and nothing posted in this space should be regarded as such. Finally, the medical evidence will be recounted here, but the reader is always encouraged to maintain a skeptical stance insofar as one may, without being an expert. As previously noted, there are definitely several risks factors that contribute to the likelihood of a child falling victim to SIDS. This is uncontroversial, and attested-to in virtually every medical paper on the subject including a 2014 review by pathologist Henry Kous (2, 6). However, there is substantial evidence that sleeping position is a large risk factor, which is why back-sleeping for infants is officially recommended by the Centers for Disease Control, National Institutes of Health, US Department of Health and Human Services, the UK Department of Health, the American Academy of Pediatrics, among other groups. A systematic review of all available data from 1940-2002 found a strong elevated risk factor for prone sleeping and SIDS (1-7). Deaths from SIDS were halved following the BTS/STS campaign in the United States. The beneficial effects are observed in many countries including the US, Canada, the UK, Sweden, The Netherlands, New Zealand, Hong Kong, and Tasmania (4,5). Apparent beneficial effects observable when education and outreach efforts applied to low SES and minority groups. Such a program dropped SIDS deaths in Mississippi by more than half between 2006 and 2012 (7). This can’t be attributed to broader trends or cause-of-death classification changes made around 1999. There is mounting physical evidence that the prone sleep position is associated with reduced cerebral tissue oxygenation which may be one mechanism involved in SIDS deaths (8). 3. Infant sleeping position and the sudden infant death syndrome: systematic review of observational studies and historical review of recommendations from 1940 to 2002. Ruth Gilbert, Georgia Salanti, Melissa Harden, and Sarah See. Int. J. Epidemiol. (August 2005) 34 (4): 874-887. 4. Wigfield RE, Fleming PJ, Berry PJ, Rudd PT, Golding J. Can the fall in Avon’s sudden infant death rate be explained by changes in sleeping position? BMJ. 1992;304:282-283. 5. Dwyer T, Ponsonby A-L, Blizzard L, Newman NM, Cochrane JA. The contribution of changes in the prevalence of prone sleeping position to the decline in sudden infant death syndrome in Tasmania. JAMA. 1995;273:783-789. 6. Krous, Henry. “Sudden Infant Death Syndrome (SIDS), Sudden Unexpected Death in Infancy (SUDI), and Sudden Unexplained Death in Childhood (SUDC).” Forensic Pathology of Infancy and Childhood (2014): 193-206. 7. Scott, Stacy. “Transferring partnership-building strategies from Mississippi to Arkansas to reduce sleep infant deaths.” 142nd APHA Annual Meeting and Exposition (November 15-November 19, 2014). APHA, 2014. 8. Gazit, Avihu Z., and James S. Kemp. “Cerebral Tissue Oxygenation Index and SIDS.” Pediatrics 134.3 (2014): 598-599. Why do I love science and ration thought? Thank you for the correction and confirming my feelings about science. rational – not ration. I need to proofread even I type just one sentence. Two words,Ed: confounded variables. See http://childmyths.blogspot.com/2014/12/sids-sleeping-position-and-single.html for further discussion. Confounded variables can’t account for many of the studies on SIDS and sleep position, Jean. For example, in Tasmania, SIDS had definitely not been declining prior to 1991. 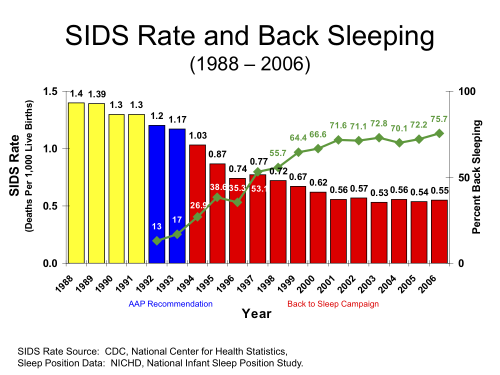 Following the change in sleep position, SIDS rates dropped substantially, immediately. There was no dramatic drop in smoking or rise in breast feeding in this 2-year window in Tasmania. Lastly, the Gilbert et al risk factor analysis would also not have found a reliable correlation between sleep position and SIDS if the problem were confounded variables because that paper included analysis of 40 studies covering at least 14 countries by my count. Please tell me what variable you believe is always secretly causing the correlation in all times and places studied that just happens to align with sleeping position. You will need to account for the false correlation in Australia, New Zealand, France, Germany, Hungary, Tasmania, Hong Kong, England, Scotland, Norway, Denmark, Sweden, Hungary, and the United States; and covering the years 1940-2012.